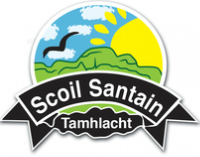 Tá Spórt an-tábhachtach i saol na scoile i Scoil Santain. Bíonn seans ag na páistí óna Naíonán ar aghaidh páirt a ghlacadh i bpeil, íomáint, camógaíocht, snámh agus cispheil. I 2009, bhuaigh an foireann peile scoile Corn an Chéíd i bPáirc an Chrócaigh. Bíonn múinteoir Páraic i mbun an spóirt le na buachaillí agus múinteoir Sinéad , Aedín agus Sarah le na cailiní. Tagann oiliúnoirí ó Thomáis Dáibhéis agus Naomh Áine isteach chun na scoile go seachtainiúl. Sport is an very important part of school life in Scoil Santain . All children from Junior Infants upwards get an opportunity to get involved with football , hurling, camogie ,swimming ﻿and basketball. In 2009 the school team won the Corn an Chéid as part of cumann na Mbunscoil in Croke Park. The girls football team also made it to Croke Park in 2014. Coaches from both the local clubs Thomas Davis and ﻿St.Annes﻿ come to the school on a weekly basis. I Méan Fómhar 1998, glacadh le n-ár scoil a bheith páirteach i dTionscadail do na Nuatheangacha sa Bhunscoil. Roimhe sin sa scoil, bhí an teanga céanna á mhúíneadh cheana féin le deich mbliana ag Hainréad Ui Fhiaich. I mbliana, déanann Rang a 5 agus a 6 Gearmáinis faoi threoir an múinteoir Nadia. All Children from fifth and sixth class have the opportunity to learn German on a weekly basis from a native speaker , Muinteoir Nadia. Mar chuid de Chlár Críochniú scoile, bíonn ranganna ceoil ar siúl do na páistí i rith am scoile. I mbliana, tá rang a 3 ag freastal ar ranganna fidil le |Múinteoir Naomi agus tá rang a 5 ag freastal ar ranganna ghiotar le Múinteoir Chiarán. I 2003, tháinig Scoil Des Carthy chun na scoile le ranganna ceoil a chur i láthair dona páistí tar éis na scoile. As part of the schools completition programme children from rang a 3 get the opportunity to learn the fiddle with Múinteoir Naomi and guitar in Rang a 5 with Múinteoir Chiarán. Le blianta beaga anuas tá páistí Scoil Santain ag ghlacadh páirt i gComortais Ficheall lastigh den scoil agus le scoileanna eile. Tá an t-adh leis an scoil Múinteoirí iontacha a bheith ann, Gabrielle agus Dee, chun suim na bpáistí a spreagadh.Ta sé faoí stiúr ag Múinteoir Mhaitiú. I 2010, thosaigh páistí rang a hAon ag foghlaim agus tá siad ag baint an-taitneamh as. For some years children in Scoil Santain are enjoying chess in school and out of school at various tournamets. They are highly regarded and doing extreemly well. Múinteoirí Gabrielle and Dee visit the school under the direction of Múinteoir Mhaitiú. Children from first class upwards get the oportunity to participate. Tágann Múinteoir Aifric isteach chun drámaíocht a dhéanamh le gach páiste sa scoil ar bhonn seachtainiúl.Is mór an spraoí agus féin mhuinín a chothaíonn sí lena páistí. Our drama teacher Aifric comes to the school on a weekly basis. Every child in the school is given an opportunity to experience drama which develops their self confidence in an enjoyable and fun way. Is clár literarthachta deimhnithe é Doodle Den atá ar súil tar éis na scoile i Scoil Santain do pháistí roghnaithe ó Naíonáin Shinsearacha. Doodle Den is an after-school evidence based literacy programme available to selected students in Senior Infants in Scoil Santain. Bíonn ranganna ealaíne eagraithe ag múinteoir Mháirín tar éis na scoile do pháistí ó rang 2 ar aghaidh. 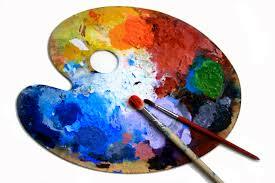 Children from rang a 2 upwards get an opporunity to participate in Art classes after school with múinteoir Máirín. Tá cór na scoile faoí stiúr ag múinteorí Aedín , Mary Clare agus Natasha. Tá fáillte roimh páistí ó rang 3 ar aghaidh. Glacann na paistí páirt i gCór Náisiúnta na nÓg gach bliain agus eiríonn thar cionn leo. Children from Rang 3 upwards get an opportunity to sing in the school choir. The school participate in the National Children's Choir annually and perform extreemly well. Bíonn deis ag gach páiste sa scoil ó na Naíonán ar aghaidh páirt a ghlacadh i ranganna damhsa sa scoil. Idir rince Gaelach nó damhsa nua -aimseartha le Nicole. All children in the school from Junior Infants upwards are involved in dancing. Opportunities are there to enjoy both Irish dancing and also modern dance with Nicole. Irish dancing classes after school with Carmel Merrigan.